East Atlanta is one of the hippest and most exciting parts of town in Georgia state because it offers many unique boutiques, lively nightlife and progressive dining options. The area attracts young local residents who want to be a part of a walkable and trendy community. The real estate market in East Atlanta is expansive and includes historical homes and updated apartment complexes. East Atlanta boasts a population of 31,069 residents and 12,999 households. Most residents are between 24 to 44 years of age and a majority of East Atlanta residents hold bachelor’s degrees, associate’s degrees or have completed some college courses. The median household income in the area is $44,173 and only 3,247 homes are occupied by families with children. Tips for renting an apartment or buying a home in East Atlanta, GA. There are several apartments for rent in the area and many are in high-rise buildings close to local shops and restaurants. Homes in this portion of the city are also frequently offered as rentals, as are townhomes and condos. 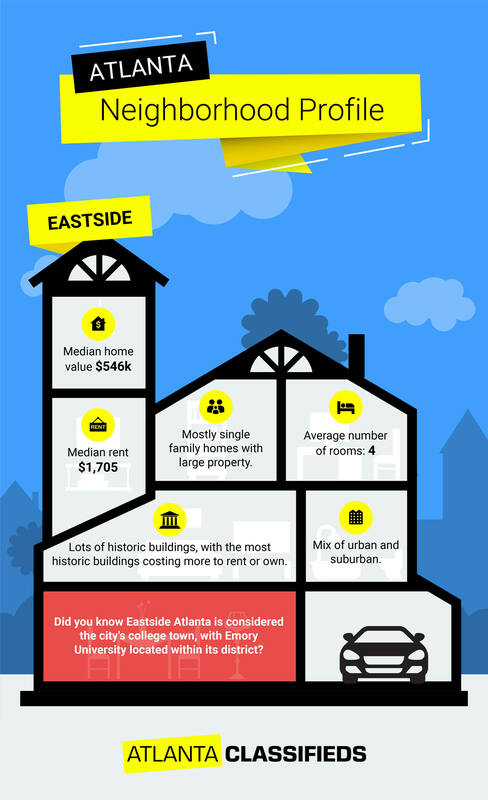 The median rent for all properties in East Atlanta is $1,800 per month. A cheap studio apartment can rent for $762 each month, while a 3 bedroom apartment can sometimes rent for as low as $1,118 per month. Both homes and apartments are plentiful for residents since East Atlanta encompasses many neighborhoods in the city. Older craftsman homes and Victorian-style properties are popular styles throughout the area and contribute to the historic yet modern ambiance. Townhomes and condos are also prevalent in the neighborhood and most homes have updated interiors. The median sales price for homes in the neighborhood is $379,900. East Atlanta is an extremely walkable area of the city. However, there are several neighborhoods within the perimeter that house different establishments. Residents who need to travel quickly to other parts of the area can use the Metropolitan Atlanta Rapid Transit Authority (MARTA), an expansive bus and train line that connects all neighborhoods within the city. The Beltline is also available for East Atlanta residents and includes a streetcar system and a network of trails to bike or walk to other parts of the city. Most work commuters in the area use their own cars to get to work and the average commute time is about 20 minutes. Mediterranea Restaurant & Bakery: Rustic spot located in Grant Park that serves gluten-free baked goods and Mediterranean food. Fox Bros BBQ: Quick-service restaurant located in Little Five Points inside Candler Park that offers classic barbeque menu items. Rathbun’s: Fine dining located in Inman Park that provides rotating delicate American dishes designed by award-winning chef Kevin Rathbun. Tiny Lou’s: Located in the Fourth Ward District, this spot offers a fun atmosphere and French-American menu options. The Glenwood: This gastropub is located in East Atlanta Village and has American food and late-night hours. Georgia state residents often flock to East Atlanta for interesting and trending food explorations. The area offers a wide-ranging mixture of casual and fine dining through several culinary genres. So Worth Loving: A hip and eclectic clothing shop for women located in East Atlanta Village. Edgewood Retail District: A shopping area with 50 boutiques, local shops and retail stores located in Inman Park. Ponce City Market: A two-story large indoor food hall in Old Fourth Ward that is also home to many clothing, shoes, home goods, gift and accessory shops. Junkman’s Daughter: A fun gift shop selling apparel and gifts in Little Five Points. East Atlanta Village is also home to a farmer’s market with local vendors offering gourmet dog treats, fresh fruits and vegetables and homemade pasta. The area draws residents from the suburbs and local dwellers alike with its expansive selection of small and unique boutiques. There is never a dull moment in East Atlanta and the area offers many exciting entertainment options. The Earl is a live music venue in East Atlanta Village that draws local acts for both day and nighttime performances. Little Five Points is well known for housing many craft beer breweries and dive bars, including The Vortex and Brewhouse Café. The Old Fourth Ward is the place to go for a fancy cocktail and ultra-lounge, such as Cru Urban Lounge and 18.21 Bitters. The overall crime rate in East Atlanta is slightly higher than the national average. However, this area offers a lower crime rate when compared to the rest of Georgia state. Most crimes committed are property crimes, such as theft. Children living in homes throughout East Atlanta attend schools in the Atlanta Public Schools district. Several charter schools and private school options are also available, including Highlander School and Braddy Preparatory Academy, both located in East Atlanta Village. Beulah Heights University is located just outside of Grant Park and is a religious university with a high acceptance rate.